60+ Shades of Grey | Write-now! Published in The Courier-Mail's QWeekend. 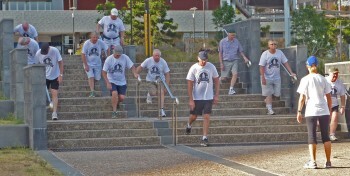 Retirement can’t dull the taste for life among a group of Brisbane men (and their dogs) who have found that the common ties of maturity can lead to new shared experiences – bottling wine, speechmaking, even line dancing. I’m in a suburban scout hall in Brisbane’s west, stomping my way through a line-dancing class alongside a bunch of venerable boot-scooting, lid-dipping locals. With shining eyes and palpable enthusiasm, Mike Skerrett has asked me to join in with the Disgraceville Greys. Attending a line-dancing class was never high on my bucket list, but how can I possibly refuse? 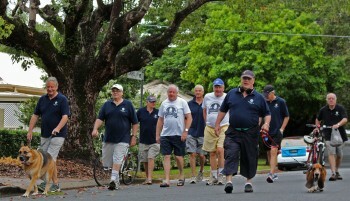 Men on the march … Disgraceville Greys (from left) Mike Skerrett (with Buddy), Roger Macgregor, Mike Howard, David Armstrong, David Milne, Lex Heinemann, Phillip Bate (with Humphrey), Neil Burton and John Armstrong. So, you may be wondering, who exactly are the Disgraceville Greys? And should I even care about them? If you are retired, or eventually plan to, you may learn something from these men. Imagine your working life coming to a close; you ease yourself into a long-anticipated retirement. It then dawns on you that your expectations of a golden endless holiday might have been a tad fanciful. After all, you’ve only got three rose bushes, pruned last week, and you’ve completed the crossword by 9am. For many men, retirement can be challenging. The work routine to which they have become inured over the years evaporates. Retirement can mean a major lifestyle change for which many are unprepared. The associated loneliness, isolation and purposelessness can lead to health problems. Research by University of Chicago neuroscientist and psychologist John Cacioppo into the effects of loneliness has demonstrated that feelings of isolation and social rejection can have detrimental effects on our thinking abilities and willpower. Cacioppo says “social relationships are fundamental to emotional fulfilment, behavioural adjustment, and cognitive function”. r sixties and beyond. They enjoy their lives. Whatever they’re on, I want some. They tell me that the group’s original members began walking together back in 2004 … they think. They met while walking their dogs. Memories are hazy, a little blurred, so they can’t tell me exactly when – but, as they say, they’re getting on and the details escape them. Back then there were just three: Skerrett, David Milne and David Rouse. After their walk the men would convene at a local coffee shop, holding court to anyone who paused for a natter. Since then, the group has gradually expanded. “People would stop and ask what we were doing there every morning,” says Skerrett. So the Greys, ever convivial, invited any men of a certain age to join them. Visits to the dog park became another avenue for recruitment. The Greys meet most weekdays. Some of them still work part-time: Skerrett consults as a property developer; Roger Macgregor works two days a week as a pharmacist; Phillip Bate writes a weekly newspaper column. At their local cafe, they have their own special “reserved” sign for their table. Staff fuss around proffering dog treats to their canine mates – Humphrey the basset hound, and Buddy the German shepherd. They are, after all, the raison d’être for the group. Sometimes Macgregor’s “grand-pup”, Frankie the Frenchie, a bulldog and a football-shaped knot of muscle, joins them too. nes about how much better he feels for the exercise. “Just one hour a week has really helped. It’s really made a difference,” he says. e way, lifted him out of his rut. When I catch up with Jan, Macgregor’s wife, she says: “This group has meant the world to him; it has just done wonders.” Clearly, he is now loving life and embracing all kinds of new experiences – including line dancing. mooth, rich lasting flavour which should never be put down”. The Greys organised a trip to the 2013 Gympie Races; 17 of them shared a Melbourne Cup lunch, and in January they went en masse to Tamworth Country Music Festival. These gentlemen, likewise, will not be put down; there is no stopping them, either. When I said I wanted some of whatever these men were “on”, I now realise it’s fellowship. These men have become friends who share a sense of belonging and purpose. They have worked at creating their own community, one that provides them with comfort and joy. Communities can be hard to find, especially in what sometimes feels like soulless, unwelcoming city suburbs. But when you do find them, they’re like shining diamonds. So do what they did. Make connections; say hello. You may find yourself line dancing alongside a complete stranger. I did. And I loved it. We could all learn a lesson from the indefatigable Disgraceville Greys. Dear Susan, Many thanks for a careful and prudent editing of the op-ed. I appreciate the effort. I agree with your changes. Best wishes.